I recently ordered a set of Hybrid Racing rearset relocators and I am quite impressed with the quality and adjustability. The plates are CNC machined and offer up to 9 different positions. I now have optimal adjustment of on track comfort and ground clearance. You just bolt up your stock rearsets to the relocators then bolt them to the frame. 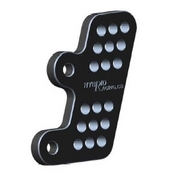 At $120 CAD, it is wayyy cheaper than buying 500+ dollar rearsets that could break on the next crash! These were made to take the impact and save your frame tabs from expensive repair. They fit all the new generation GSX-R's. Try em out, you'll love them!